I woke up with Michael Jackson blaring in my head this morning, a rare occurrence on a weekend morning that I can only attribute to a memorable moment on the second to last day of our design-build workshop and learning lab with my #teendesignheroes. Feverishly design-building our telephone booth porch with only a few hours remaining before our final presentation, Frances Nemtin, had her health care aide drive her to the site for a closer look at the building and set up a chair on our building site. One of the early Taliesin Fellows and now well into her 90’s, Frances is still whip smart, to the point and lucid as she must have been when she first arrived at the Fellowship in 1946. Not long after she arrived, Michael Jackson, a motivational standby for this year’s #teendesignheroes, started playing. In the midst of the design-building frenzy, out of the corner of my eye I caught Francis– having just visited the dentist and not as mobile as she once was when she rode her bicycle 45 miles from Madison to Taliesin to visit the Fellowship– enthusiastically stomping her foot and tapping her knee in time with Michael J.
I often employ the incredible energy of youth to stimulate change in an organization, school or place. On one hand their enthusiasm can be infectious and inspiring but they can also be incredible role models, challenging adults to do more, much more- be more creative, better behaved towards one another, put their money where their mouth is, acknowledge the challenges at hand or completely rethink a situation. In these ways, employing youth to initiate or model change can be incredibly subversive and powerful. In regards to stimulating adults into action, I call this the ‘If a kid can do it, so can I’ syndrome. Here’s a great interview demonstrating this phenomena that I conducted during my Fellowship research at the National Building Museum this spring- this is not an anomaly and is something that I take advantage of all the time. in which they documented how the average seven year old is a considerably more creative problem solver than an adult. Many people are currently cheerleading the role of youth as problem solvers in their schools and communities–and they absolutely can be (this is the center point of our work) but they can’t solve everything. As my interview above demonstrates, we often overlook the simple power of youth acting as creative role models for adults. 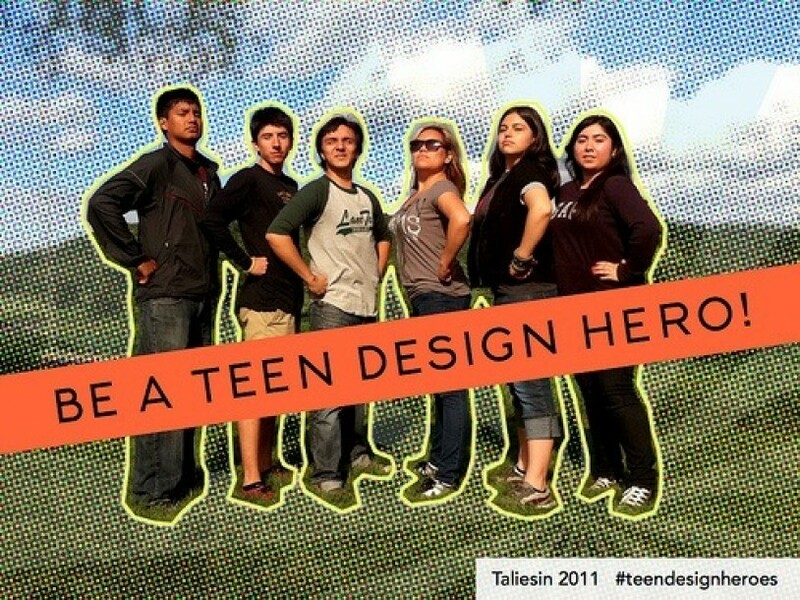 Of course Frances was tapping away to the music because it was Michael Jackson but also because she was embracing, if not celebrating the spirit, energy and work of our #teendesignheroes, and what this represented. This wasn’t the #teendesignheroes only interaction with her, in fact she subsequently invited the team to her house to tell them stories about the early days of the Taliesin Fellowship, her position as one of the only female heads of a major museum (Milwaukee Art Museum) in the United States in the 1940’s and to give each of them one of her books. This was pretty cool on a number of levels but these interactions and those with other members of the Fellowship are symbolic of much, much more. Although many of Public Workshop‘s clients love kids, it is a rare situation when others not only acknowledge but fully embrace youth in such subversive roles, particularly in such a closely guarded place, with deep, deep history as Taliesin. However, it was clear to me that to many at Taliesin, the students represented the very same rebellious, disruptive but positive spirit that infused the early days of the Taliesin Fellowship. It was wonderful to see this deep connection and such a profound desire amongst Frances and others, to not only support our #teendesignheroes but to be a part of that energy.